There are places best experienced in summer, and there are places best experienced in the fall. Unlike summer, with long, hot days and evening thunderstorms, fall is usually more stable in the Alps. The days are shorter, the air is clearer, and the temperatures crisp. But not all areas are created equal when it comes to offering the magic of fall. In this collection of runs, we're sharing some of our favorites to do from September until the snow starts to stick. 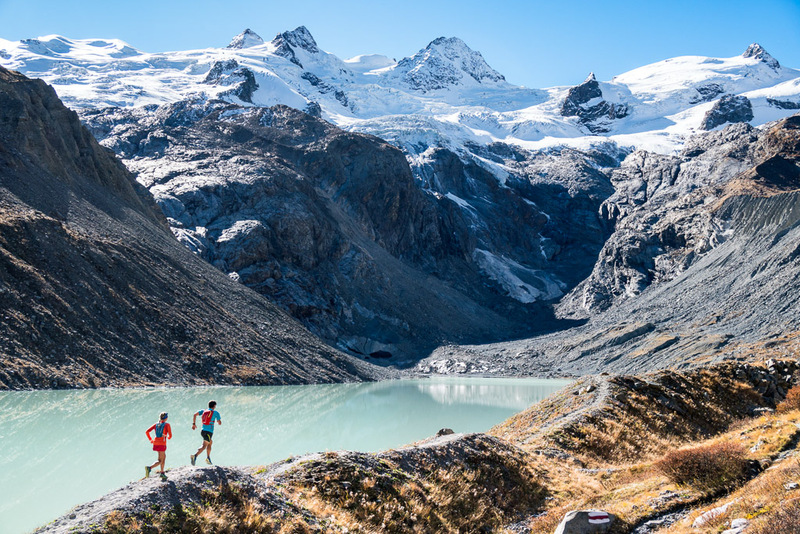 Just outside Pontresina, the Rosegtal offers a brilliant trail running loop below glaciers and the 4000 meter Piz Bernina. 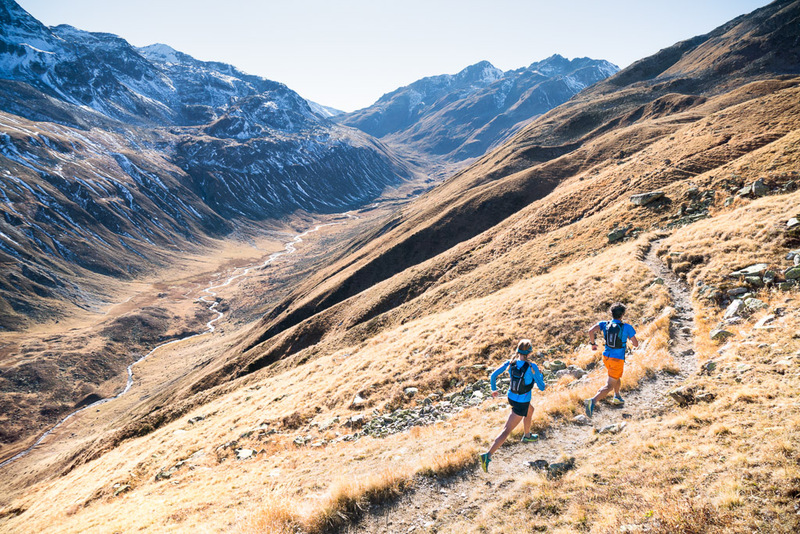 With a variety of trails, and ideal altitude for training, the Engadine is a runner's paradise. It's especially beautiful in the fall with golden larch and the mountains newly white with snow. A photo we made of the Val Funtauna while mountain biking in 2012 stuck in our memory. In the meantime, we'd also discovered Bergün, with its Romantsch charm, and regularly regarded as one of Switzerland's most idyllic villages, to be the access point to the valley. Designing the book runs, we knew we had to include a run here so people could experience both Val Funtauna and Bergün. What we ended up running fulfilled both requirements, in fact the run traverses the valley twice. You'll get your fill of the Val Funtauna. This run has a great combination of smooth cruising trail and plenty of vertical climb. Reaching the summit of Piz Languard, you have an unmatched view of the surrounding summits, the valleys spreading in every direction, and the changing colors far below. 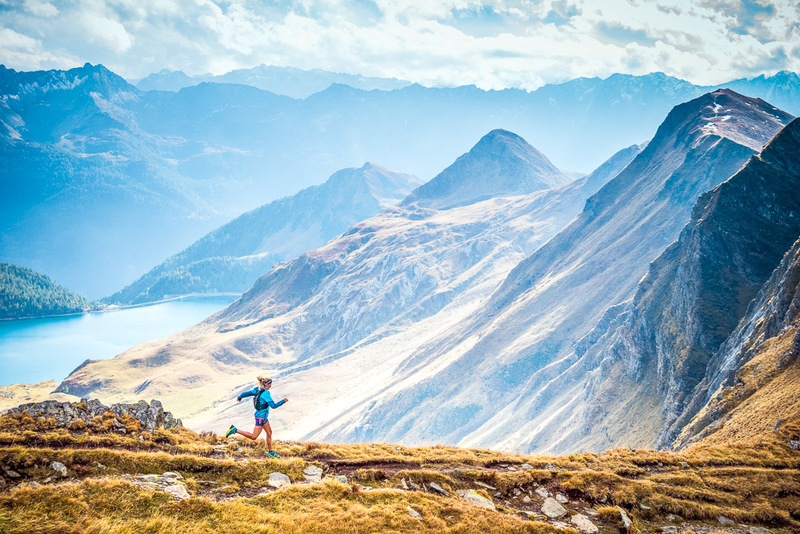 Golden larch, turquoise lakes, and a snowy summit make this a must run in the Engadine. This is an easier run, not so many kilometers, and the gain won't destroy your legs, but the setting is no less beautiful than longer days in bigger mountains. You might spend more time out here than expected since the lakes and views entice you to stop and linger. Not far outside St Moritz, you begin by curving along the calm turquoise water of Lej Segl. Located in the Valle Verzasca, this is a wild run in a quiet region of the Alps. You may even have the summit of Monte Zucchero to yourself. Despite being the second-highest in the region, it’s less often summited than nearby peaks. The trail makes a steep climb and a little scramble to the summit. The downhill side of the mountain is rolling with vast traverses, but still challenging, alternating luxurious, grassy cruising with rock-hopping. Lakes, waterfalls, prayer flags, yaks... It’s like being far away without traveling far at all. "They're squares." Dan says. "Way over there, those are yaks not cows. You can tell because they're more square." Sure enough we run into a herd of Tibetan yaks grazing along the Swiss slopes. Between the trail company and the tattered prayer flags, it seems we've run much further than planned. And while these are great trails throughout the summer months, the blueberry bushes blazing red make this run even more beautiful in the fall.